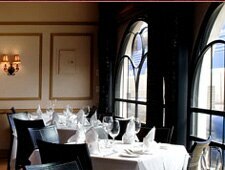 Art Deco elegance and New American cuisine meld together effortlessly, bringing classic romance back to Orange County. : This instant-classic-for-romance restaurant at San Juan Capistrano’s train depot features three elegant yet down-to-earth rooms: the more traditional main salon with three large arched windows, the restored 1927 Pullman car with red velvet curtains and subtle Art Deco touches, and the original 1887 freight house. What makes Rendezvous even more special is the fact that it is run by a family. Longtime restaurateur Yanni Ikonomou and his charming wife, Char, oversee the front of the house with genteel hospitality. Their son-in-law, Peter Arachovitis, is the talent in the kitchen. His seasonal menus of what he calls “new American cuisine” are sumptuous renditions of classic European and California dishes with innovative twists using the freshest of local and flown-in ingredients. Soups, salads and a warm foie gras dish are bursting with flavor and color. Arachovitis is adept with balancing tangy with sweet in modern ways. For example, the signature sea scallops have a bit of spice from the chipotle crust, some tang from the goat cheese and a bit of sweet in the orange-honey butter glaze. There’s also lots of game: venison, guinea hen and bison with a coffee crust and a smoky and well-bodied wild mushroom ragù sauce. For dessert, try the well-crafted soufflé, along with French-pressed coffee for two. Or opt for the goat cheese cheesecake surrounded by a Scotch caramel glaze. The wine cellar sits in the restaurant’s airy train station-like hallway and is a rather good compilation of old- and new-world boutique wines. The service deserves special mention as it is as comforting and refined as the new classic food.